The Academic Success Center employs a team of math tutors who are ready to help students better understand math concepts. Some of the tutors are students who excel in math classes while others are individuals with advanced math degrees. To ensure that you get quality time with a math tutor, we recommend that you call the center to make an appointment. The math tutors do accept walk-in students, but appointments take priority over walk-ins, so there may be a wait. Each math tutor has specific specialties; please review the staff list to find a math tutor who can best help you. 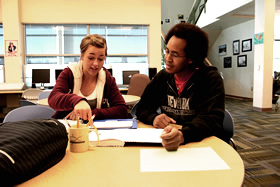 The Academic Success Center offers tutoring for a variety of science classes. Usually help is available in biology, anatomy/physiology, and chemistry. On any given semester, we may or may not have tutors for specific science classes. To find out what is available, please contact the ASC. Tips and how-to guides are available under the Math/Science Resources link on the menu at left or by clicking here. Call now to schedule Math/Science Tutoring at 775-753-2149 or e-mail a specific, detailed question to tutor@gbcnv.edu.